The host country won took gold to claim the ‘Bob Church Trophy’ after landing 71 fish to Ireland’s total of 49 fish. England took third with 40 fish and Wales fourth with 35 fish. The International tournament sees the anglers fish for rainbow and brown trout with all fish measured and released after been hooked. The competition was only Dr. McClenaghan’s third appearance for the Irish team though she is also presently undertaking her APPAGI Coaching Certificates. 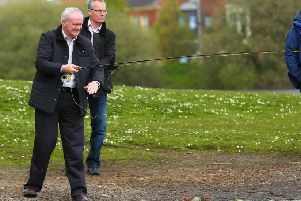 Indeed the local angler was coaching beginners to fly-fishing at the North West Angling Fair in Strabane only last weekend. Dr. McClenaghan was named Sports Person of the Year in the ‘Derry Journal People of the Year’ Awards in 2014 after taking took up fly-fishing for trout three years ago having previously fished for salmon with her father for over 25 years. Dr. McClenaghan is currently an Executive Director at the Lifestart Foundation, who educate parents on how children develop and learn. Before leaving for the Scottish International for Ladies Flyfishing, Pauline traveled to Dublin to meet with President Michael D.Higgins, who hosted a reception for the Irish Ladies Flyfishing Team and to wish them ‘tight lines’ at the International.